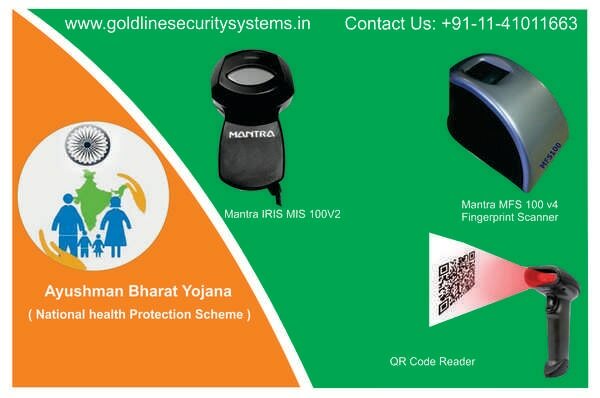 We are the authorized Supplier and Distributor for Mantra Single Iris Scanner and Mantra Single Fingerprint Scanner with QR Code Reader for Aadhaar card Verification and Ayushmaan Bharat Health Protection Card Creation. Mantra MFS100 V54 Fingerprint Scanner is used to verify the aadhaar card holder through biometric identity of fingerprint and Iris Scanner verifies the Biometric Identity of Aadhaar and Ayushman Card Holder by Scanning or Retina or iris sample of which is already available in Aadhaar card Database. While using the facility of Ayushmaan Health card identity on Ayuhsmaan card is scanner for fingerprint and iris scanners and QR Code Reader to identify the patient.We are the authorized Supplier and Distributor for Mantra Single Iris Scanner and Mantra Single Fingerprint Scanner with QR Code Reader for Aadhaar card Verification and Ayushmaan Bharat Health Protection Card Creation. Mantra MFS100 V54 Fingerprint Scanner is used to verify the aadhaar card holder through biometric identity of fingerprint and Iris Scanner verifies the Biometric Identity of Aadhaar and Ayushman Card Holder by Scanning or Retina or iris sample of which is already available in Aadhaar card Database. While using the facility of Ayushmaan Health card identity on Ayuhsmaan card is scanner for fingerprint and iris scanners and QR Code Reader to identify the patient. Call us for procurement and Material Delivery in Very Good Prices.